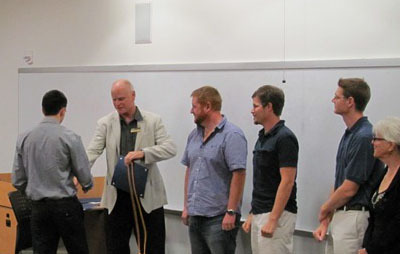 TAMPA, Fla. -- The University of South Florida Department of Cell Biology, Microbiology and Molecular Biology held its annual Honors Convocation on May 4, to celebrate the accomplishments of its students and educators. The awards ceremony recognizes students who sustained a 3.9 GPA, a first generation student who has risen above the odds, teaching assistants who go above and beyond and the educator who provides the foundation to encourage students to stay progressive. Five cell and molecular majors--Sarah Brady, Stephanie Holdener, Adam Lomas, Neeti Pradeep and Roanak Shah--and five microbiology majors--Steven Cindric, Richard Cocchieri, Jacob Cohen, Chelsea Gorsline and Sara Subar--received the award as graduating seniors with a GPA of at least 3.9. In addition, Lacey Harrington received the Outstanding Student Award and Juliana Cafiero was awarded the CMMB First Generation College Student Award. Graduate Student Pamela Fay was awarded the Outstanding Teaching Assistant Award and Kristina Schmidt, Ph.D., received the CMMB Outstanding Educator Award. Schmidt, an assistant professor and the recipient of the Outstanding Educator Award, said she was always interested in science and currently researches DNA repair and replication. Schmidt undoubtedly brings enthusiasm and field experience with her to the classroom. Schmidt said she was amazed to know her colleagues thought so highly of her and was beyond honored to receive such an outstanding award. Schmidt said as an educator her main job is to energize her students to think independently, and to be resourceful and diligent. Cafiero truly identifies with the importance of being inventive. As the winner of the First Generation College Student Award, Cafiero has leaped over many hurdles in her lifetime. With the support of caring teachers and family, Cafiero said she has strove past adversity and made her family incredibly proud by eliminating the pattern of non-scholastic members. Grateful for her difficult experiences, Cafiero said graduating is a privilege, and she will not take it for granted. It is an honor she is proud to bring to her family, Cafiero said. Pamela Fay, teaching assistant to assistant professor James Riordan, said she was surprised to be nominated for the Outstanding T.A. Award and even more surprised she won. Fay said she feels amazingly honored to be recognized for her preparation and time devoted to her students. Juggling a thesis on molecular mechanisms for regulating acid resistance and E. coli O157:H7, Fay understands the importance of having a great educator and striving to be a great student. “We need scientists and that means we need more teachers to make science challenging but fun and interesting as well,” Fay said.